Utah honeysuckle is a western North American species with white / creamy or yellow flowers that is found in "Moist to mesic meadows, grasslands, shrublands and open forests" in southern British Columbia (Douglas et al. 1998). Deciduous, ascending or erect shrub, 0.6-2 m tall; twigs glabrous or nearly so. Opposite, short-stalked, elliptic to somewhat egg-shaped or oblong, rounded to somewhat heart-shaped at the base, obtuse to rounded at the tip, 2-8 cm long, 1-4 cm wide, glabrous above, often thinly hairy beneath and on stalks. Inflorescence of pairs of flowers in leaf axils, on the ends of 0.5-3-cm long stalks; involucres of 2 pairs of very small bracts; corollas cream or light yellow, funnel-shaped, 1-2 cm long, scarcely 2-lipped, the 5 slightly unequal lobes much shorter than the tubes, which are hairy within and have short thick spurs at the bases. Berries, red, 0.7-1 cm across paired, united at the base, 2- to 4-seeded. Moist to mesic meadows, grasslands, shrublands and open forests in the lowland, steppe and montane zones; common in SC and SE BC, rare in SW BC; E to SW AB and S to MT, WY, UT and N CA. 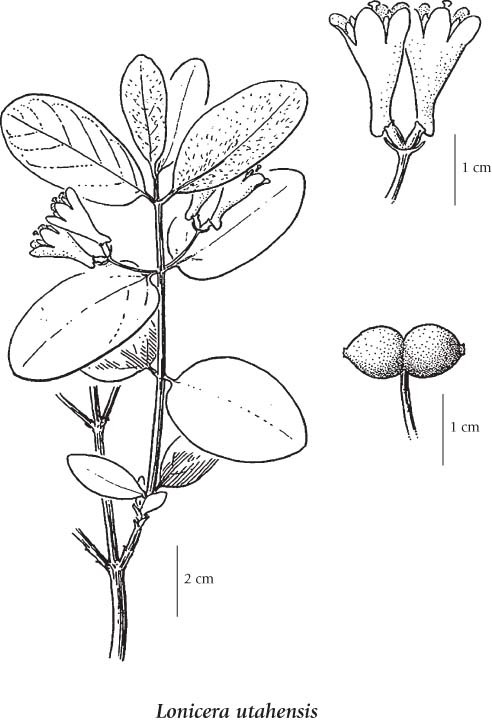 A shade-tolerant/intolerant, montane to subalpine, West­ern North American deciduous shrub distributed more in the Cordilleran than the Pacific region. Occurs predominantly in continental subalpine boreal and cool temperate climates on nitrogen-medium soils; its occurrence increases with increasing elevation and continentality. Sporadic to scattered in herbaceous understories on water-shedding and water-receiving sites in the coast-interior ecotone. Characteristic of subalpine continental forests.